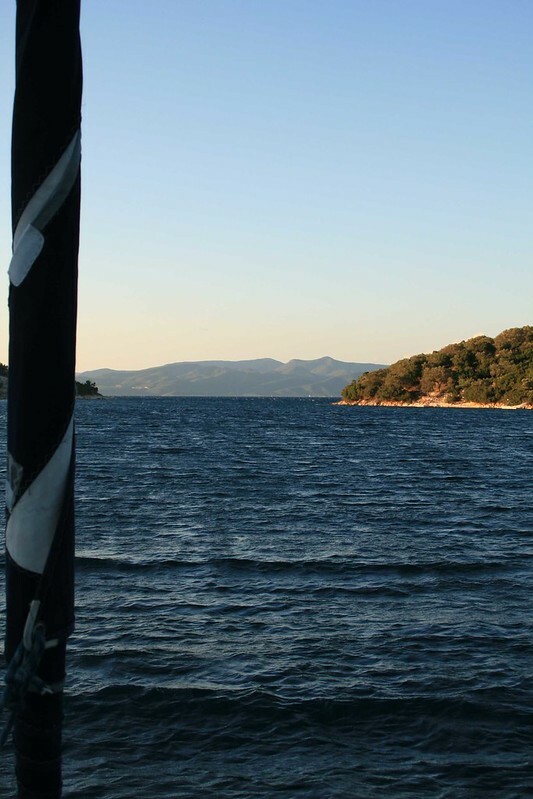 Céphalonia – Levkas –Meganisi – Ithaque : the greek paradox! 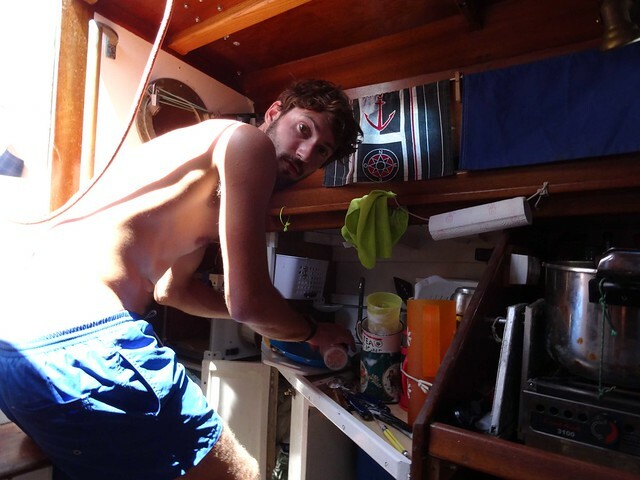 Well arrived in Argostoli, after 60h of sailing through thunderstorms, we move the boat to fill the water’s tank, to take a shower and to wash our clothes. Here the mooring is a little bit different than what we’ve seen until now. We always use the anchor, even in the marina. The boat is perpendicular to the dock, the anchor in front of the boat and two ropes behind attached to the dock. But perpendicular… It depends. Sometimes, another boat put his anchor above the chain of another boat, and then it becomes problematic. That is exactly what happened to us: a ferry put his anchor on our chain. 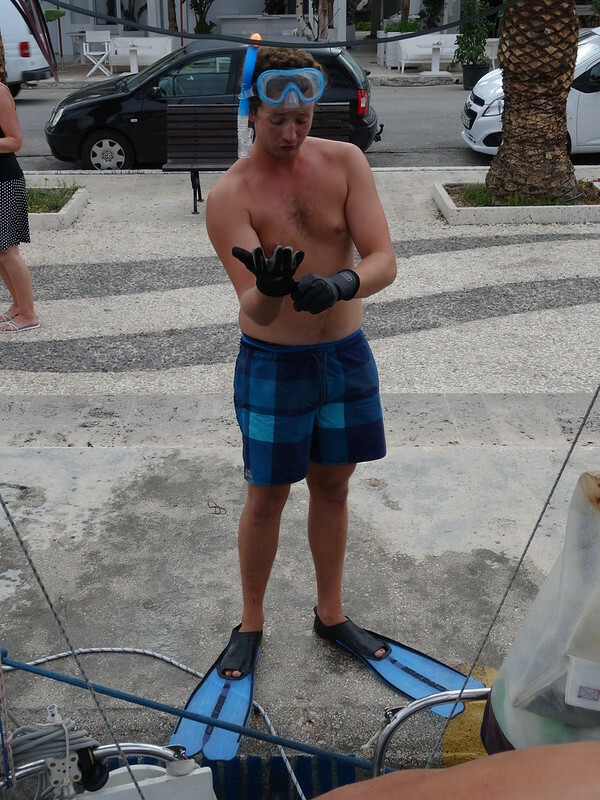 We then had to dive during 2 hours and with 2 fenders to get our anchor out of the ground. Then we head to Lixouri, a small city close to Argostoli where we are all alone. 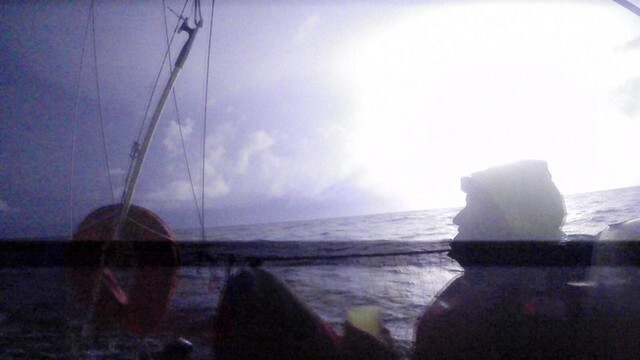 But unfortunately the shelter is not as good as we thought: winds and waves are very uncomfortable for the boat. If the anchor moves, the back of the boat will touch the dock without letting us the time to react. Then a policeman tells us that it is forbidden to stay here. He advices us to move to another dock where it is more sheltered. We enjoy there a very calm night, far from the noise of the city. 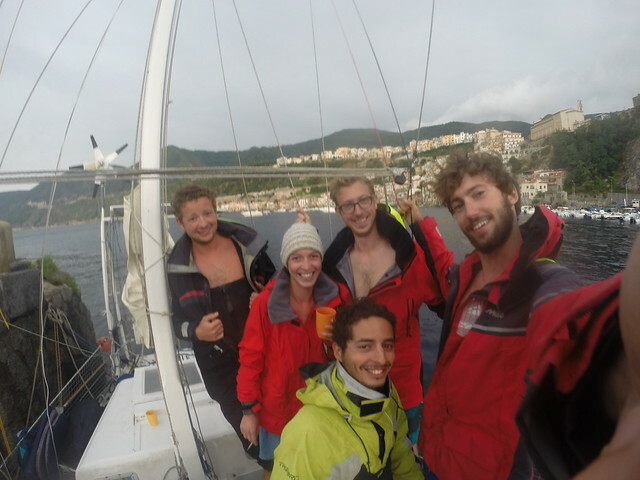 The day after, we sail to Fiskardo, a city at the north of Cehalonia. We go all along its west coast where we can see beautiful white sand’s beaches and colorful cliffs. 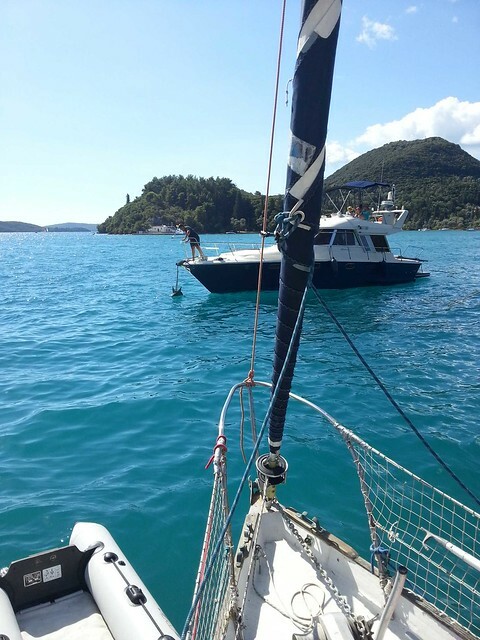 Once in Fiskardo, we get another mooring exercise. The docks are full and we have to moor near a road on the other side of the city. We still have to put our anchor in front of the boat and two ropes behind. 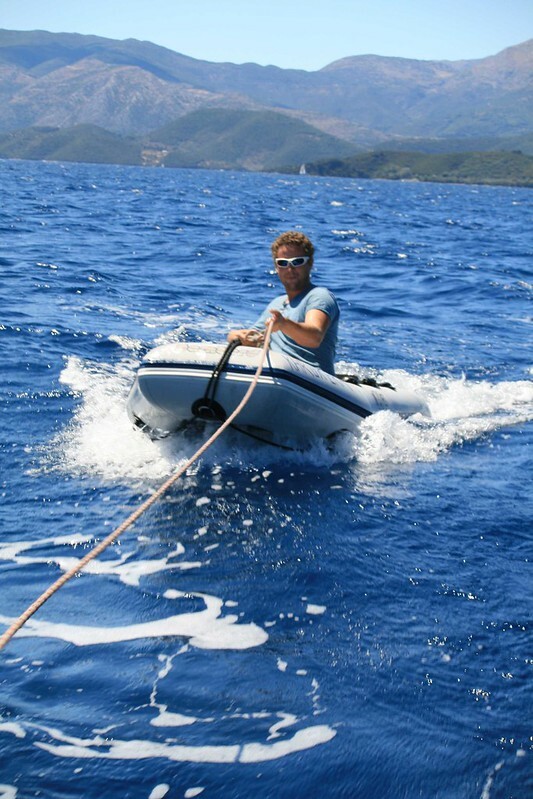 The ropes need to be tied on the ground before with the dinghy because the boat has to be moored 20 meters from the coast (because of the depths). It is our first time and we do it without any problem. Being five aboard is a real advantage! Unfortunately, our neighbor come one hour after us and, one more time, put his anchor above ours. The day after, when we want to leave, we have to dive again. 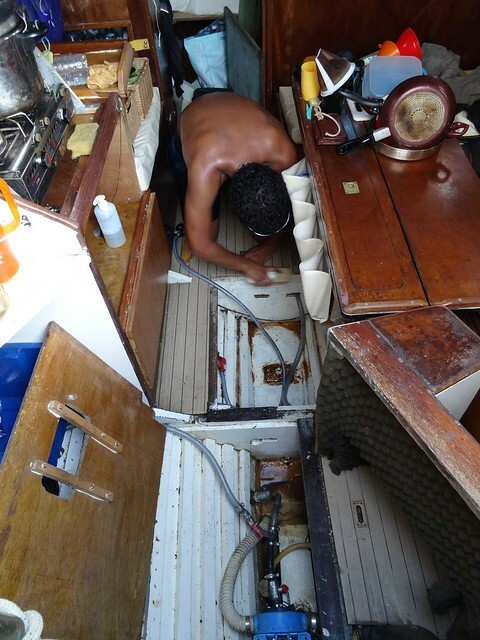 Water is clear and his anchor is light, it is much more convenient and 10 minutes after we are ready to leave but… Our engine doesn’t want to start, because of the electrical starter! Ok, let’s repair it! 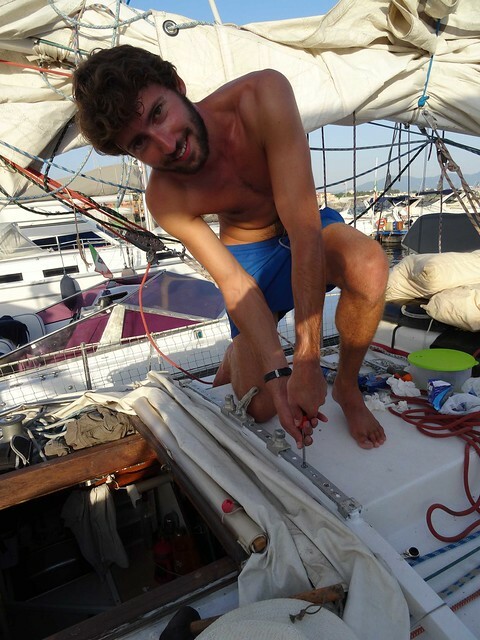 In the same time, Olivier repairs the rail of the mainsail on the mast. Since the beginning of the trip it has been seriously damaged. But two climbs to the top of the mast, some new screws and it will last 20 more years. But the starter isn’t so easy to repair. During two days we try but without any result and no one can help us in Fiskardo. We have to move. 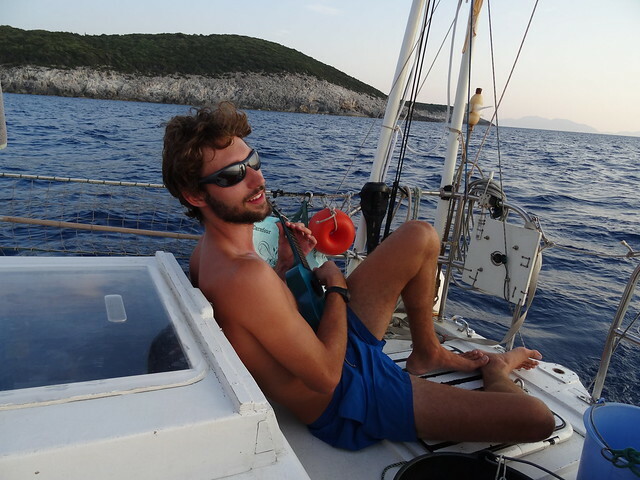 In Levkas (the island at the north of Cephalonia) there are shipshandlers and mechanics, we decide to sail there. Hopefully we had expected it could happen and we had brought a hand crank starter. It is physical and easier to do when the sea is calm. Wind helps us to go quickly to Nidri (the city in Levkas). There we are lucky because we find an electrician without difficulty and he has the missing piece. We want to buy it but he refuses, he wants to repair it himself. It is more expensive but we have no choice and we let him the starter. We come back the day after to take it back, he has done a very good job, the starter works perfectly! Once again we have some difficulty with our neighbor’s anchor. But this time we were still sleeping… A good way to wake up quickly! 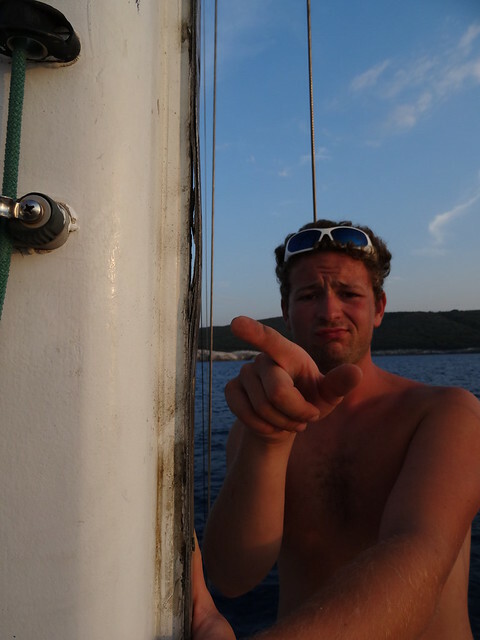 But the guy is cool, after having literally fished our anchor, he put it back at its place. Technical problems are resolved. We can enjoy the 5 last days in Greece. After that we will have to head to Sicilia. 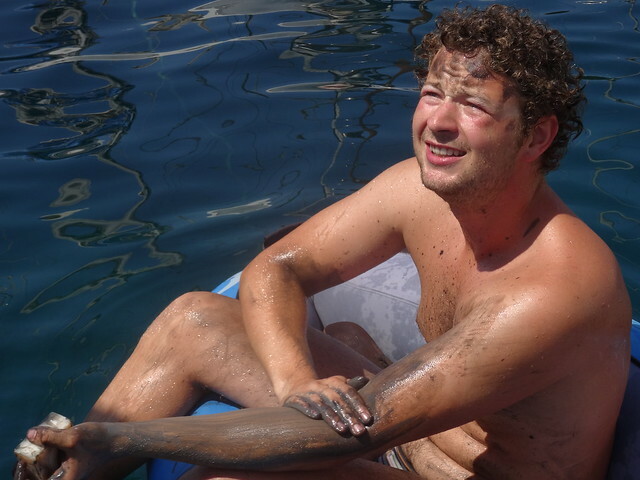 But today we are going to Meganisi, we make a sampling of plankton and some surf with the dinghy behind the boat. In the bee bay, the mooring is similar to Fiskardo. The only difference is that the rope is attached on a tree. But the depth where we put the anchor is important, we have to put all our chain. Maybe a little too much: we lost the anchor with all the chain. At the end of the chain, there is a rope but, apparently, the knot wasn’t well done. So everything felt at the bottom of the sea. Hopefully, we have a second anchor that we used while we are taking back the first. One hour later, the boat is closer to the coast. The anchor seems to be slipping. We can’t sleep here so we leave to the next bay. 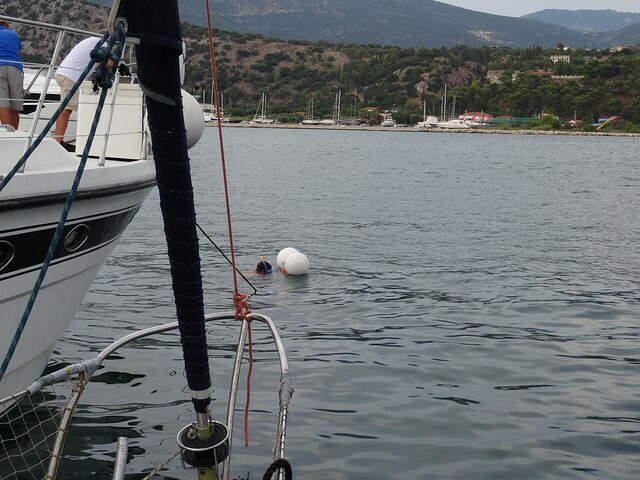 Hopefully the next one is much better, we put the anchor with 5 meters deep without any rope attached to the coast. The night is excellent, Karukera alone under the stars. nce in the city we can enjoy a shower at 3€. Moreover, temperature are decreasing and that is very appreciable no to sweat 20 minutes after the shower. Weather forecast allows us to leave on the next day. We fulfill the tanks in Ithaca, it is the only city around where we can have diesel (we still have to walk 1km with the tanks to have it) and after we move to Fiskardo. There we will be able to buy cheaper food and it is a good location to leave to Sicilia. Once we have bought food and some souvenirs from Greece, we leave to Sicilia. 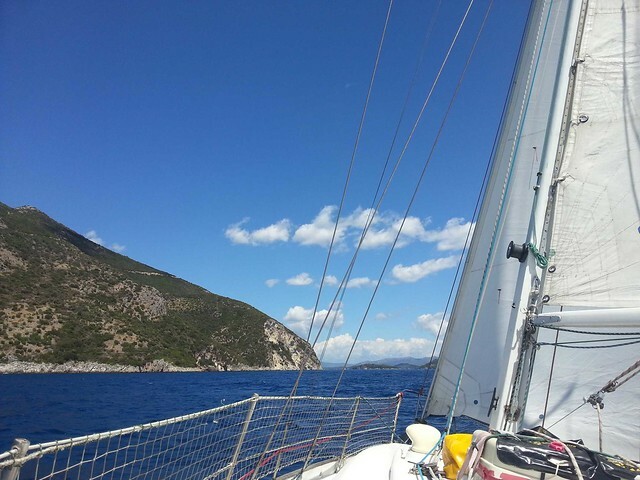 We have just left Fiskardo and we put the mainsail. 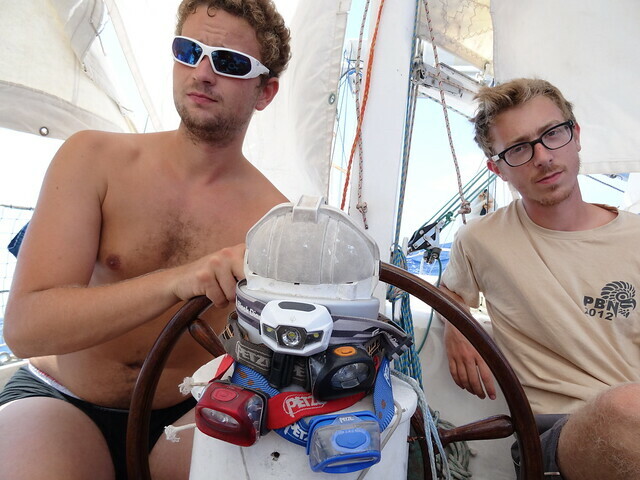 But the rope of the reef is blocked in the GPS, we don’t see it and it breaks our GPS. 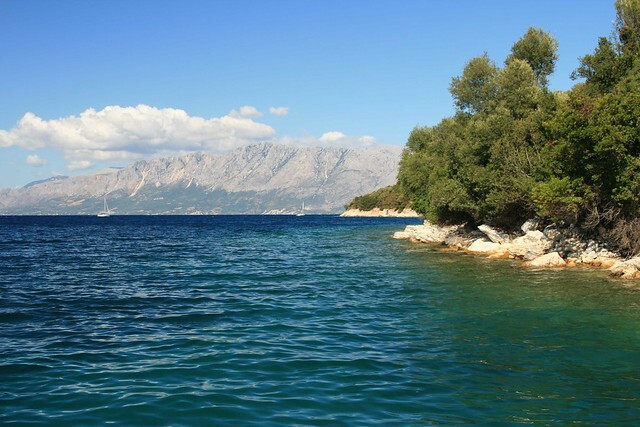 We decide to go back to Fiskardo to try to repair it. 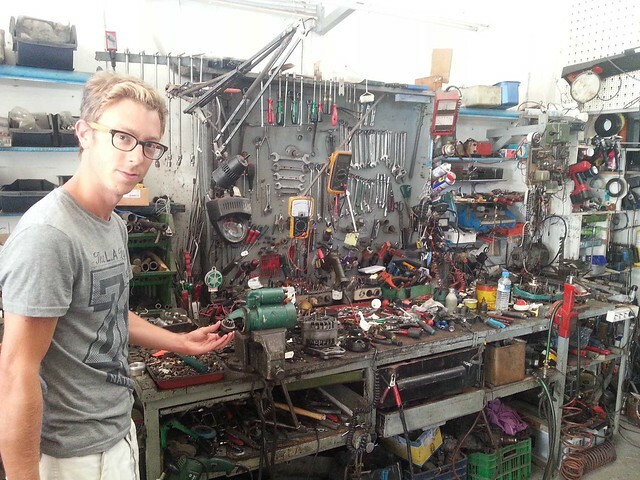 While Adrien and Alix were working on the GPS, Olivier was repairing the fairleads that have suffered in Ithaca. 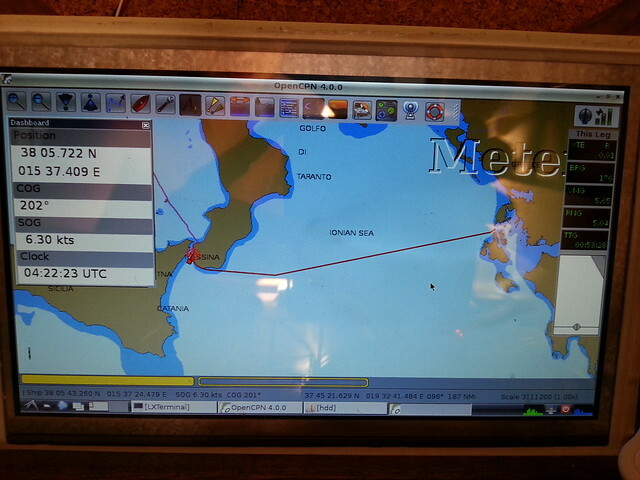 Unfortunately, nothing works on the GPS and the only shipshlandler doesn’t have any. He can order some GPS and it is very expensive and it will arrive only in 4 days…we are not interested. 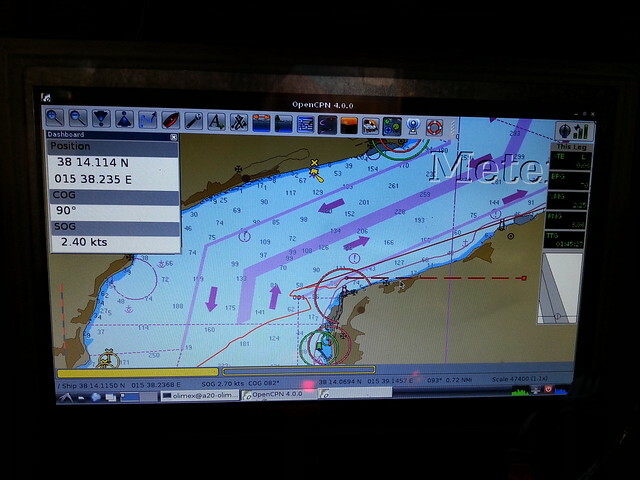 We decide to make the crossing only with our GPS phone. The day after, early in the morning, we leave Fiskardo for the third time. 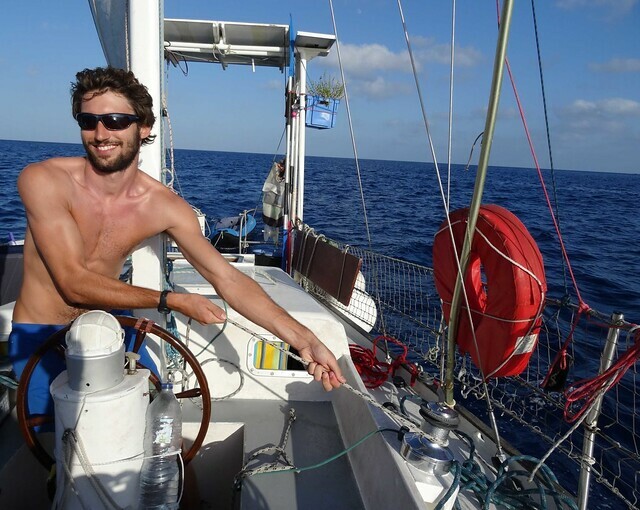 The sea is rough, the wind is strong and it comes from where we are heading : the 24 first hours will be hard! 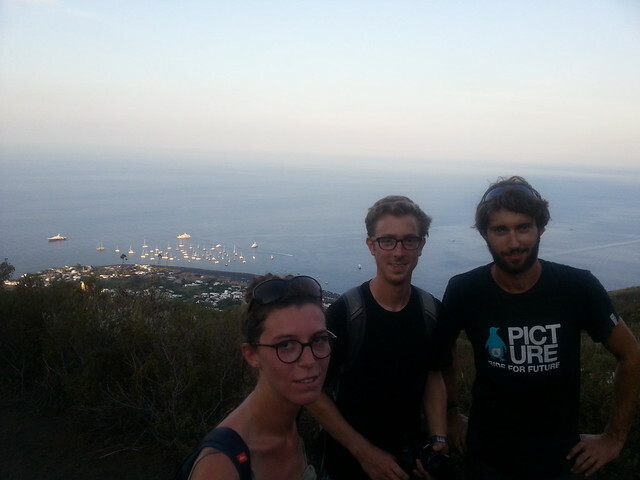 Stromboli – Greece : back in Bretagne ? 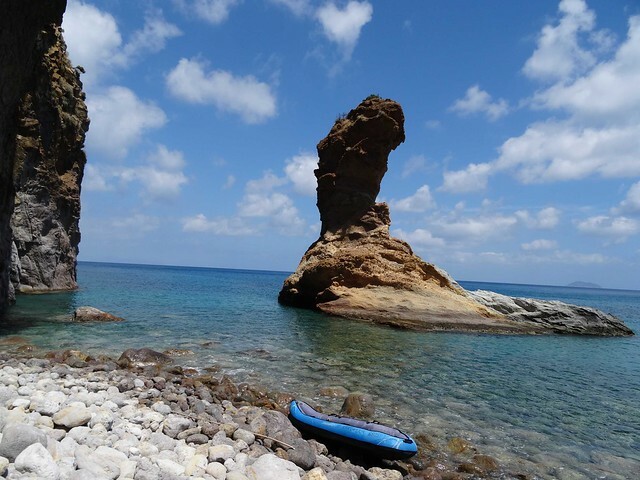 Sicilia, Ionian Sea, Greek Islands, words rhyming with summer tranquility and beach umbrellas. Do you think Karukera’s crew overlooked postcards ? We didn’t wear our raining jackets this often since April, which will solve our hygiene problems, but mix humidity and heat, and you will have thunderstorms. 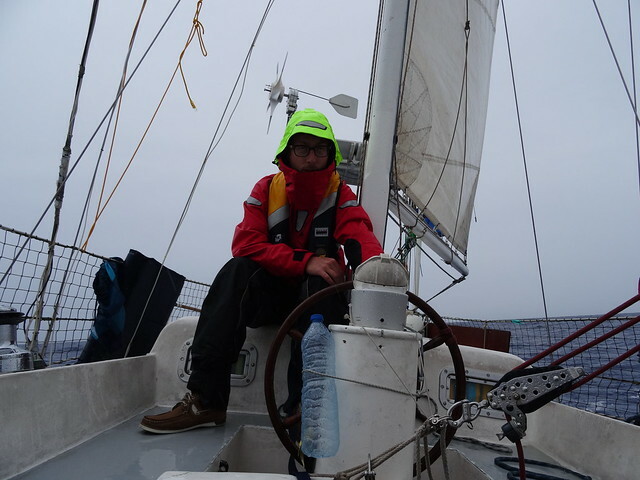 The anemometer will rise up to 60 knots numerous times in ten days, the winds and the rain are intense. 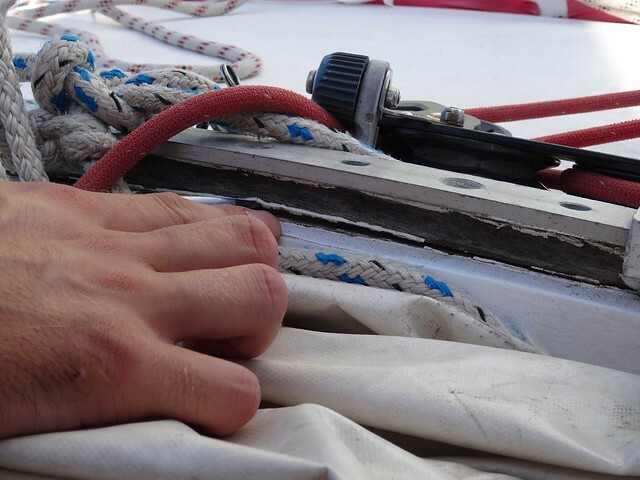 Good training for the crew, hoisting and putting down the sails a little bit too often. Heading to Greece, we leave the Stromboli behind. We have to take the Messina strait, the separation between Sicilia and the foot of Italy, a necessity to go to the most oriental point of our voyage : the Ionians. Scylla will be our last harbour before entering in the eastern mediterranean, a highly mythological zone. The nice western breeze forecasted, will quickly turns into a good eastern breeze, and we can see thunderstorms far away on the horizon, disappearing while we get closer to the coast. Scylla’s harbour is quite not dedicated to leisure sailing, but one ferry dock is free, only used on Sundays. A charming, free harbour ? Awesome ! The same kind of thunderstorms that of the previous day, will violently interrupt the town tranquility. 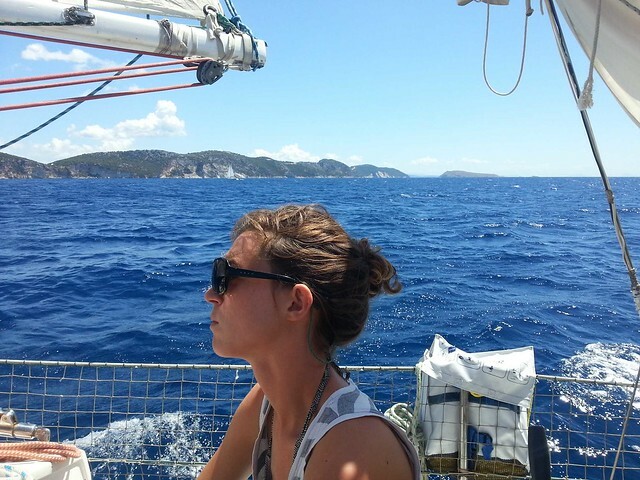 Winds fastly rise to 60 knots, the waves coming from our stern, and Karukera is pulling strongly on her lines. 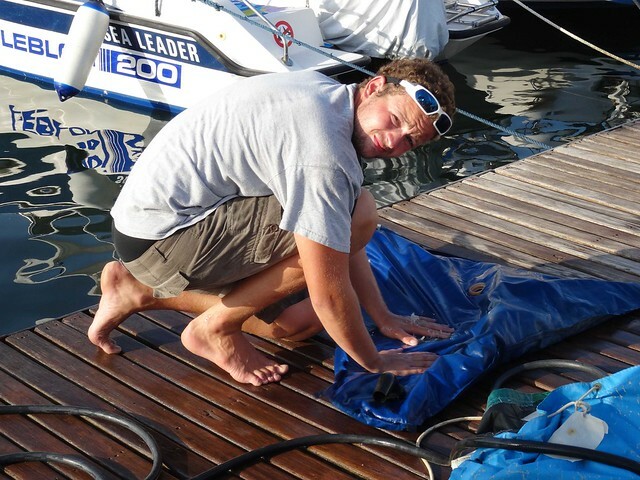 So hard that we will tear off a mooring cleat from the concrete. Thanksfully Oliver released the rope fast enough, or it could have sunk our boat. The episode will last around one hour, and 7 lines are attached to all strong fixation points of Karukera’s stern, with the engine at full power to release the lines’tension. 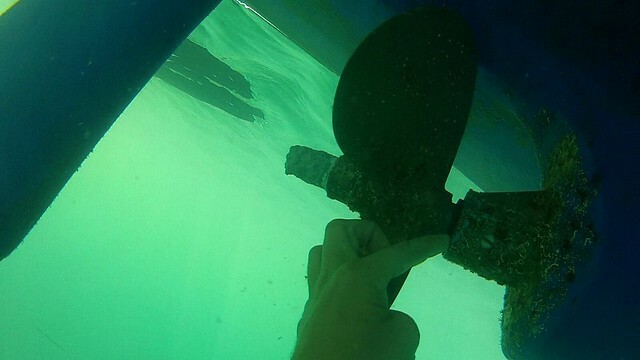 One of our stern cleats will almost break, and will damage a tiny little part of our deck. 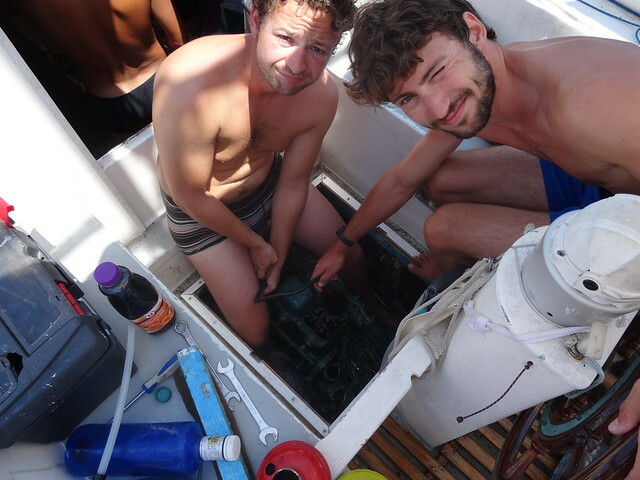 An easy repair, but we are exhausted, fully wet, and we surprisingly enjoy a hot tea in the middle of the summer. 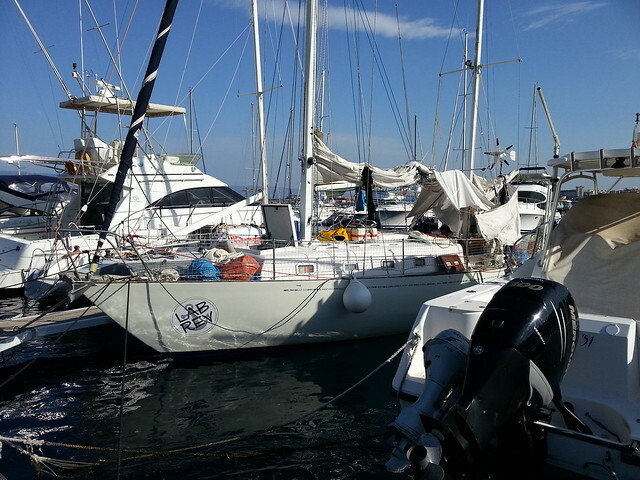 On the following day, we head to Reggio Di Calabria, a very expensive marina that offers a lot of services. We need to refill before crossing to Greece. An unexpected meeting will happen with Saveiro, a typical character of Reggio. Taxi driver, shipschandler, mecanician, wine, cheese and salami producer, offering various unexpected but helpful services. 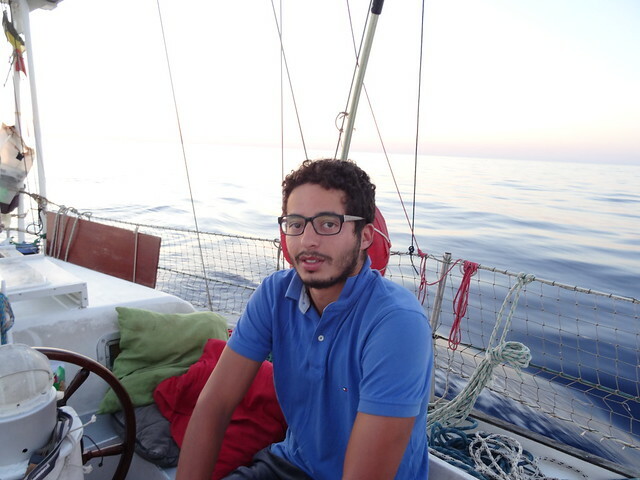 The nautical guides mention him, and he his well known from all ships cruising in this part of the mediterranean. He will drag us into his place, where we discover car and windsurf rental are some others of his activities. Offering us a fresh glass of good white wine, we leave with a whole parmiggiano and some salamis. The next day, he will post our postcards after dropping us up at the ATM, before driving us to the supermarket. He will wait for us with the car’s bonnet open, on a forbidden parking space, simulating an engine problem. Saveiro has his tricks, and will manage to sell us red wine and some more salamis. It’s time to leave before we become penniless! 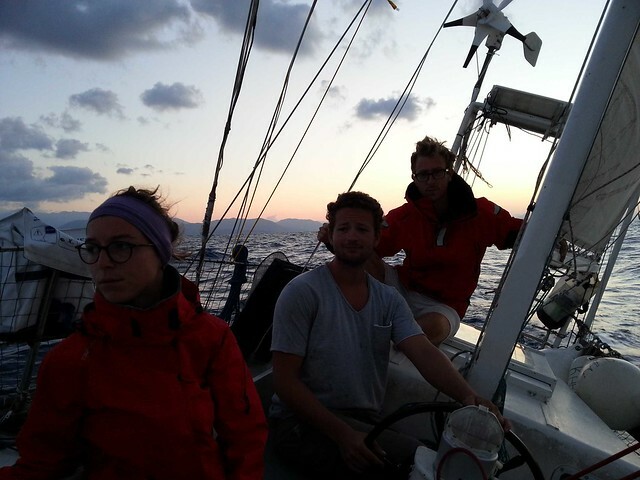 500km and approximately 60h of navigation to go to Greece, and with the moderate south breeze forecasted, we think the weather window is perfect. And on the first day it is ! We take advantage of it to 3D print new buttons for our oven, who were really damaged. Being 5 aboard, the first night is not exhausting. Far away, we see lightning illuminating the horizon. But we are at the edge of the system. For half an hour, the wind will blow 180° from where expected, before getting back to normal. Not a big deal. 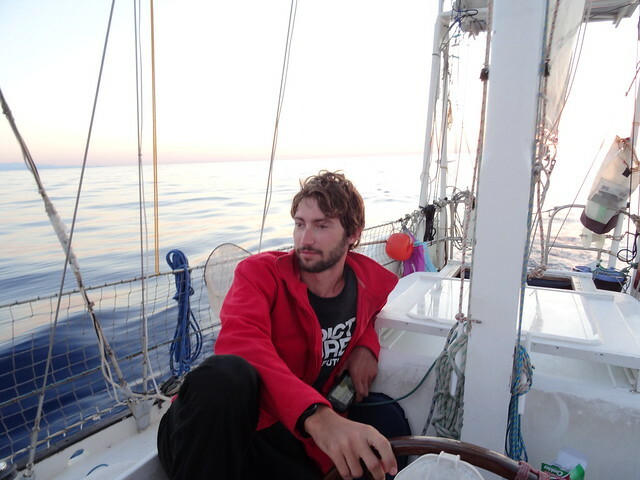 The second day is great : the boat sails quickly, and we travel through a lot of miles. At the end of the day, the air is hot and moist, and the wind slows a little bit. We see the first lighting just after twilight. They will follow us all night long. We are surrounded by big Cumulonimbus that appears in the flashes of lightning. The density is close to photo-shooting standards, with fresh drinks missing. If the thunder has obviously a very small statistic chance of damaging a sailing boat, if it does it could be very harmful. We tie the anchor chain to the mast ‘cables, and establishing a bridge to water, we reduce the potential damage that the hull could suffer. We Zigzag in the middle of thunderstorms, and will get very lucky not to get closer than to 3 kms from a thunder. We made a 15km detour to avoid an impressive cloud, covering all over the sky’s verticality. Numerous times at night, we will suffer the powerful gusts close to clouds so dark that we can see them at night. The wind will rotate so many times during this episodes, and the anemometer will measure gusts up to 60 knots. 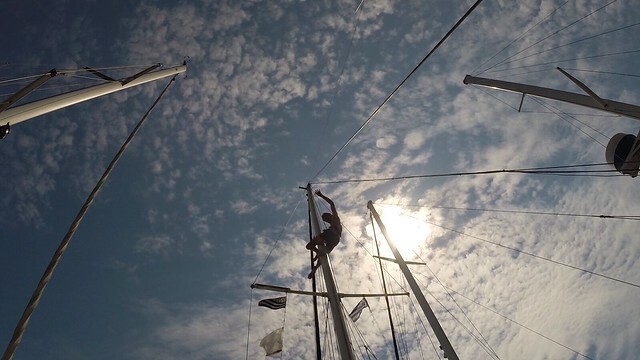 Hoisting the sails and put them down in the middle of the night is a very physical exercise for the crew. With a suffocating heat, conditions are off course ideal to rest our spirit and body. Headlamps are ready all night to be able to react to any situations. Because we have to joke about this, we make a nice garland around the compass. But the sun is setting up, and the intense cloud cover have one merit. The dawn freshness will accompany us for long hours. While sleepers rest, the manoeuvring team has time to revisit the raining vocabulary. Drizzle, mist, showers : the variety is as surprising as confusing. While we are at the beginning of our last main stopover of the trip, and as we think to the gorgeous Brittain’s weather that will awaits us in mid-November as we get back, what does this intense rain tells us ? Probably that the Mediterranean forecasts can be even more wrong that in any situations we have encountered before. But this hard crossing is getting to an end, and smiles are coming back. The Greek islands are on sight ! 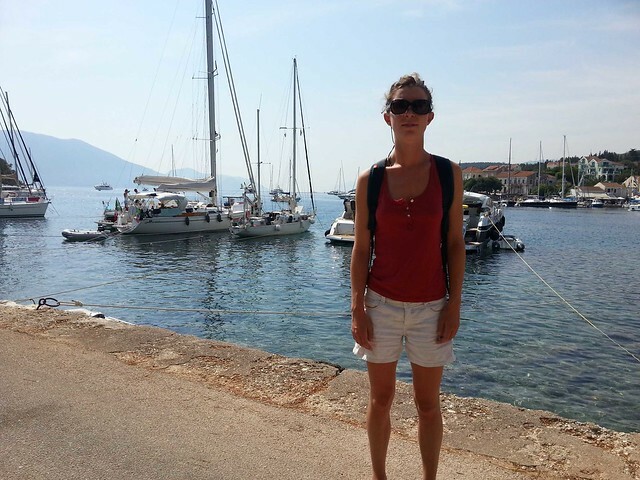 We need to do the check-in with the immigration services in one of the entry port of Greece : Argostopoli. On Cephalonia, the first stop seems dazzling: the night costs 12€, and comes with the same services as Italians 4 times more expensive marinas. A supermarket and a market 50 meters away, and numerous kebabs in the surroundings will offer the crew all he has been looking for after a long time in Italy and during the crossing. We have ten days to enjoy the Greece’s pleasures before heading to Sicily. 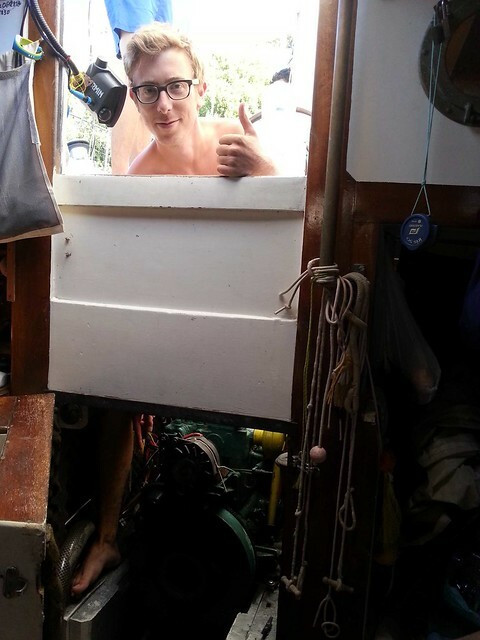 A few technical problems are awaiting us, but we will take a good shower on Argostopoli’s dock before noticing it ! 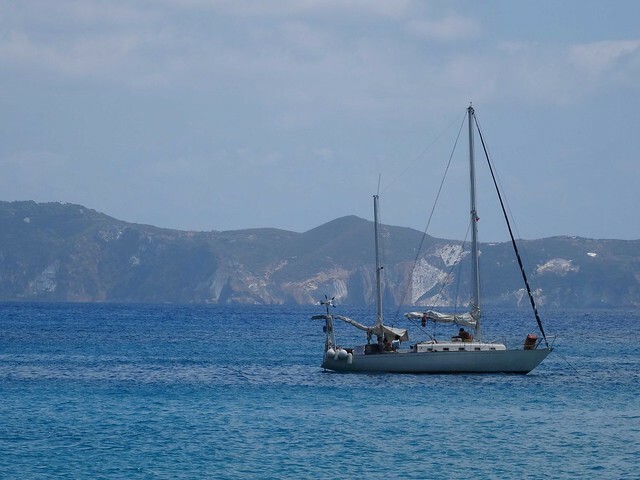 Ponza – Stromboli. Tell me : when was our last shower? Hygiene, oh hygiene ! We miss you so much ! A real impression of being sticky, with sheets tinted with perspiration, solar cream and mosquito repulsive. 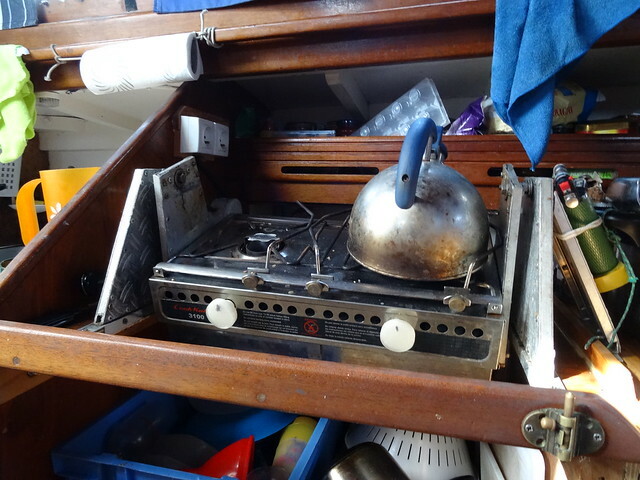 No, there is no shower nor washing machine aboard Karukera, which we should explain to the ormeggiatori, the marinas’ tenants, whom we offently have to negociate with ! We need to go to bars to go to the toilets, wash with the docks’ freshwater in our swimsuits. We also have a coconut-based soap that works in the seawater, and we rince with our solar showers. But it’s closer to grooming ourselves than really cleaning. We stink, but not too much ! 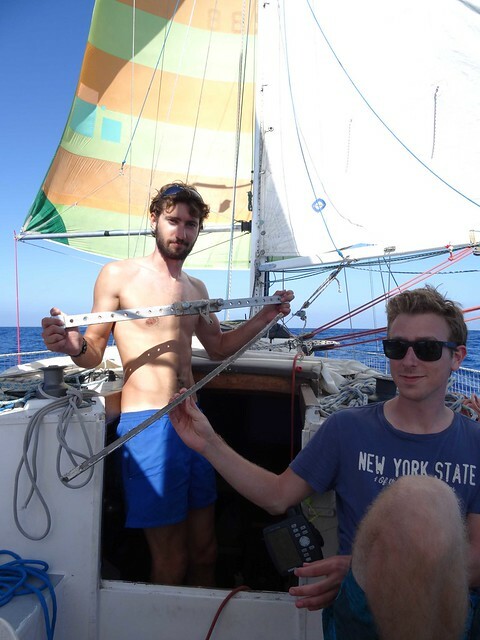 On our way, we discover that the mainsail rail (the piece that allows us to regulate the sail’s angle) is getting ripped of. 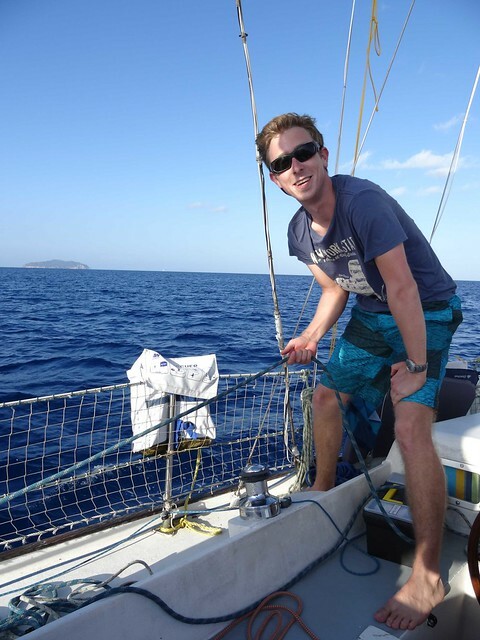 With a rope doing its job in the meanwhile, we disasemble it while sailing with the spinnaker. The Spinnaker is pushing us to Naples’ Bay. 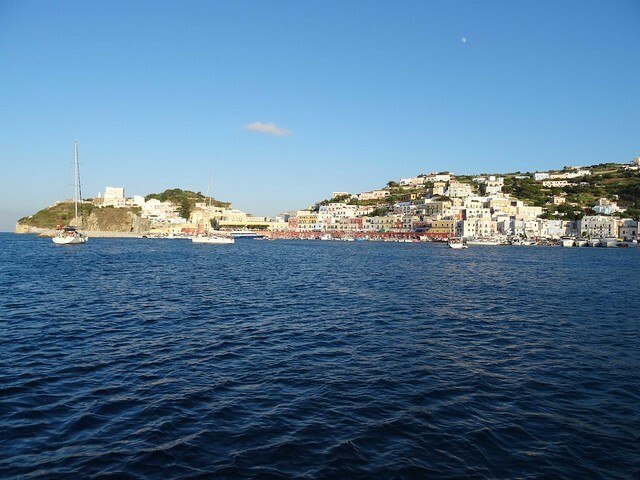 We will spend one night in the gorgeous islands of Ischia and Procida, but the water is spoiled. 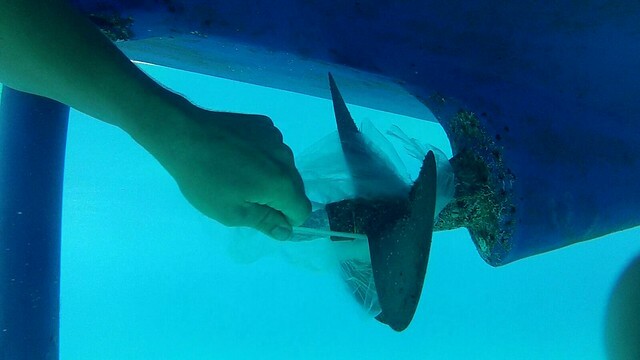 We are used to dive to check up the anchor, and in Ischia, we discover a mix of sands/cans/sanitary towels/butts holding the anchor. What a pity that it’s not even enjoyable to bath with the quantity of trash floating. The zodiacs and other fast motor boats that pass quickly in the middle of the anchoring area have definitely exasperated us. They finish the noise/wave pollution around 2 to 3 o’clock in the night, and start back just after the sun sets. We are even thankful to those who pass at a moderate speed, with not too many waves, and avoiding the risk of damaging the propeller with a swimmer. When we head out to Naples, the marinas are crowded, no room is left. So we head to Torre del Greco instead, a town near Naples. It feels like arriving in Cergy Pontoise when you planned to visit Paris. No big deal : we are very close to the Archeologic site of Pompei, and the Napolitan Cergy is quite charming. 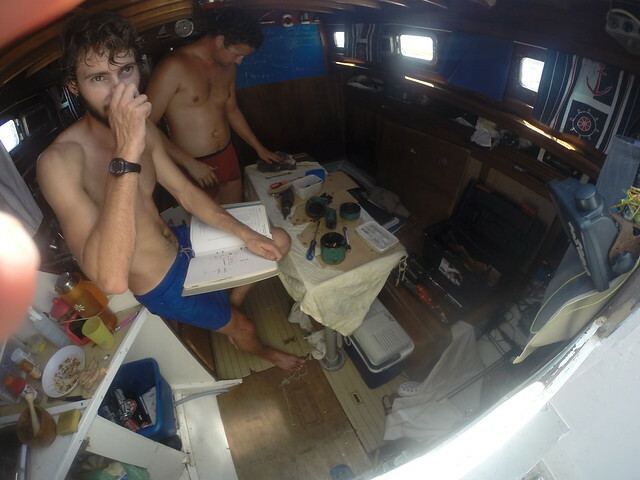 The stopover in a harbour is more than welcomed : long is the tasklist on Karukera. 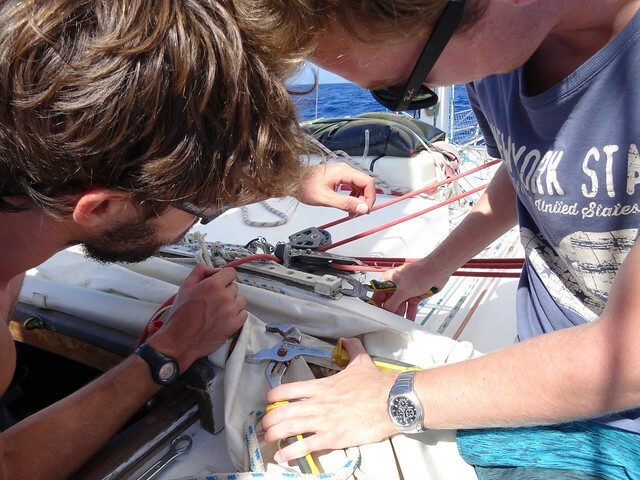 The repaired mainsail rail is installed, and we start a big cleaning ! But in the boat’s wedges, there is our flexible water tank. It is dirty, in the inside as well. This water is not used for drinking, but for the washing up and the cooking, and it has stagnated too much. We sterilize the tank with an appropriate product. Oliver can now finish his turn for the washing up ! After this technical stop, we head to the Eolies, an archipel counting two active vulcanos. 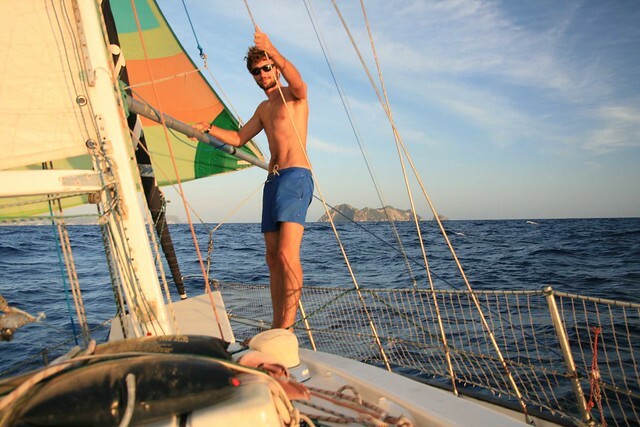 A 100miles after Capri, where we made a short stop, we have to make a night sailing. The wind will blow until midnight, and we will finish with the engine. 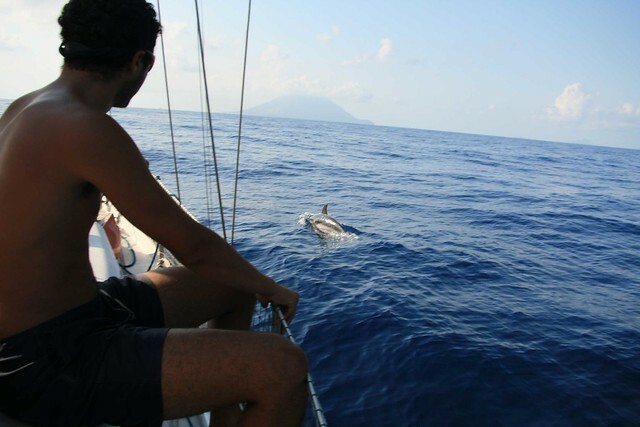 At dawn, we see the Stromboli vulcano while dolphins come and play around the boat ! 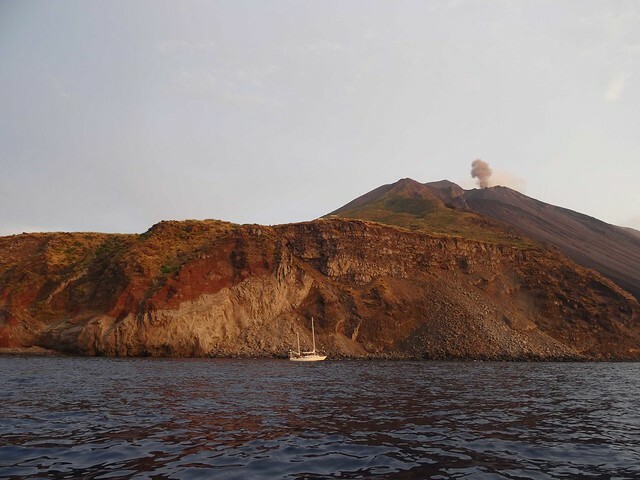 Stromboli is the second most active vulcano worldwide. He regulates his activity by his regularity instead of accumulating energy and releasing it violently. A pretty good idea, because we plan to anchor at the vulcano’s foot. 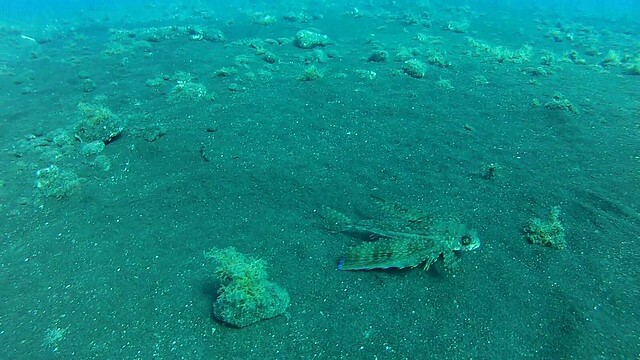 The sand where the anchor is settled is black, and the fishs are very strange, and totaly unknown ! We can see the Vulcanos eruptions frequently, but the crater is on the other side. We organize a litlle trek with a local guide. The top of the mountain is at 900m, and we climb at night, the idea being to see the red lava in fusion. The show is impressive ! So much that we decide to stay one more night. 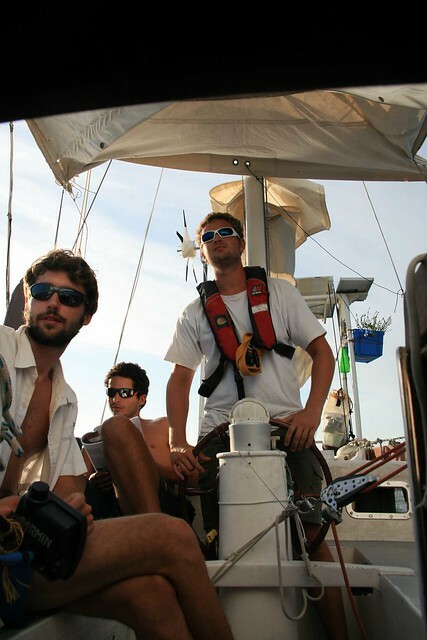 On the next night, we drop the anchor at the Sciara’s foot (the path that the lava takes), the time to have dinner. We feel ridiculously small compared to this giant monster, and we leave the anchoring to go sleep on the other side of the Island. We have now sailed a little more than half of the trip. It is time to make a little sum up of our situation. 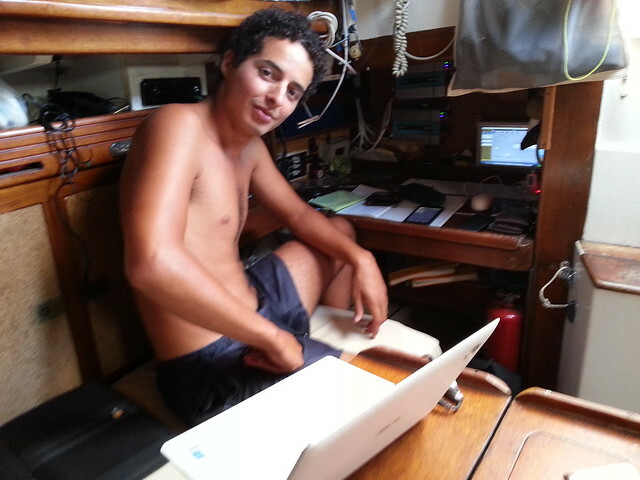 Alix and Yahia have to leave the boat at the end of August : where ? We left France one month late because of our engine problems, and we have to be back before winter, so the itinerary has to be shortened. It’s time to make a decision. The crew really wants to go to Greece, the most eastern point of our trip. We won’t be able to go to the Cyclades islands, nor take the Corinthe Canal. We will visit the Ionian islands. 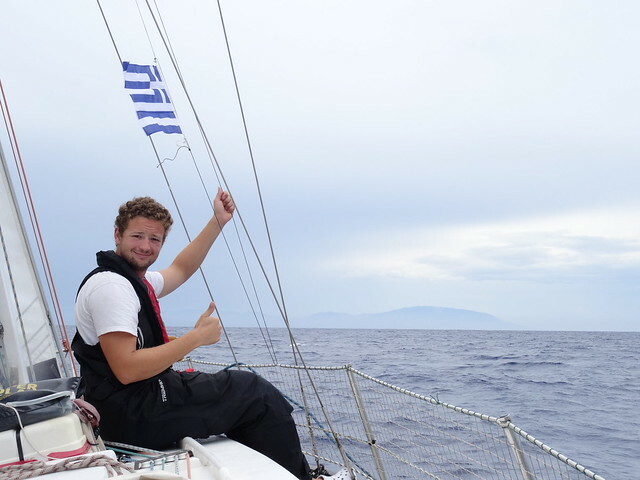 Unfortunately, the weather is bad for ten days : without wind, how can we cross to Greece ? We will have to wait before going : 48h of engine is not an option. An other radical choice has to be made : we won’t be able to go to Tunisia. The itinerary is shortened, some of the stopovers canceled, the plane tickets of our friends booked. Obvious diasppointment, but we had to expect that our program was going to change. We want to enjoy Greece a maximum : we head to the Messina strait, the separation between Italy and Sicilia, to be as close to it as possible. As soon as the winds will blow, we will set sails ! 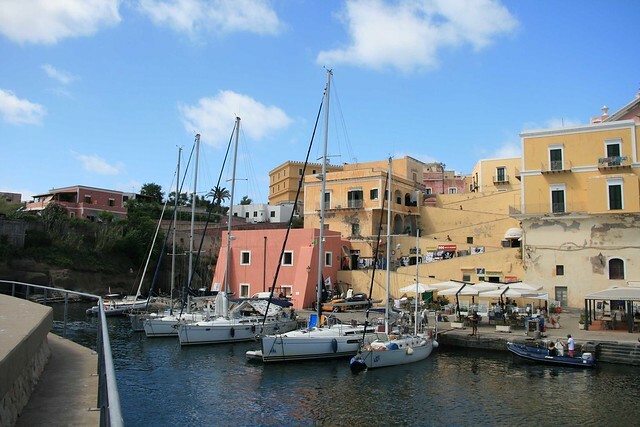 Roma – Ponza : ugly marinas and wonderful islands ! In the middle of the summer, sailing in islands’ archipelagos is so much more interesting than visiting cultural cities, as interesting as they could be ! 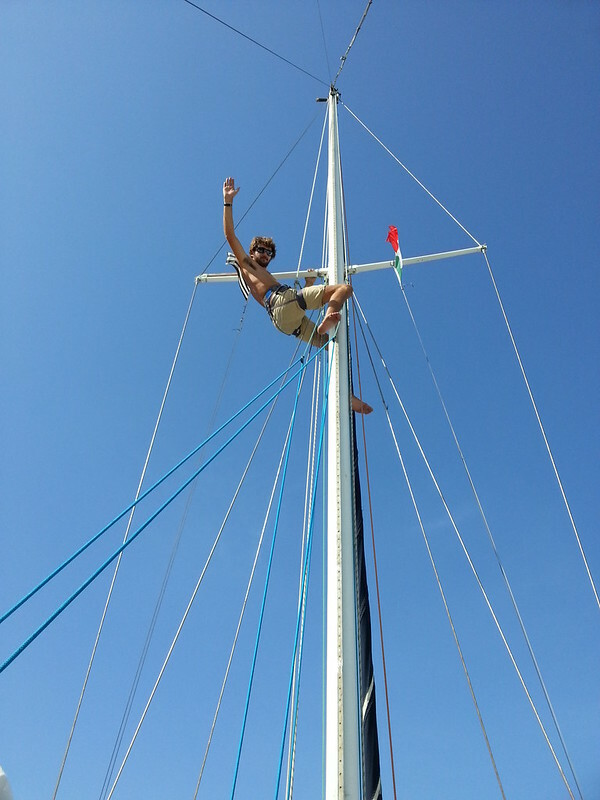 in the marinas : 41°C pollluted air, 50€ per night and wasted seawater VS at the anchor : 33°C, free night and turquoise waters with stars in bonus : what would you choose ? I just forgot that fresh beers are unavailable under the stars. Well there is a good side to every situation ! But don’t be surprised we made a lot more photos of the second part of this step ! Once arrived on the Italian coast in Riva di Traiano, we set sail on the next day to Fiumicino. The nautical guide speaks of a litlle and cheap marina, with showers and water, for a very interesting price : no doubt we head there ! 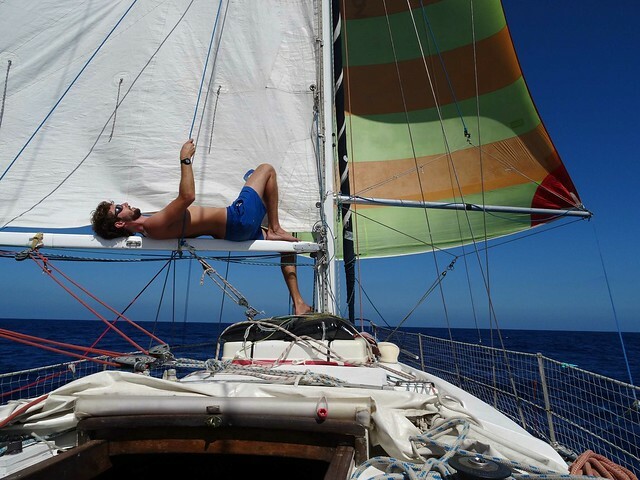 The thermal breeze allows us to sail the whole afternoon, letting the engine rest a little bit. The paradox are the ugly industries we see on the coast : the thermal wind is here because the coast is hotter than the sea, so they contribute to our well-being while wasting the landscape. Weird ! But less than Fiumicino’s surprise ! 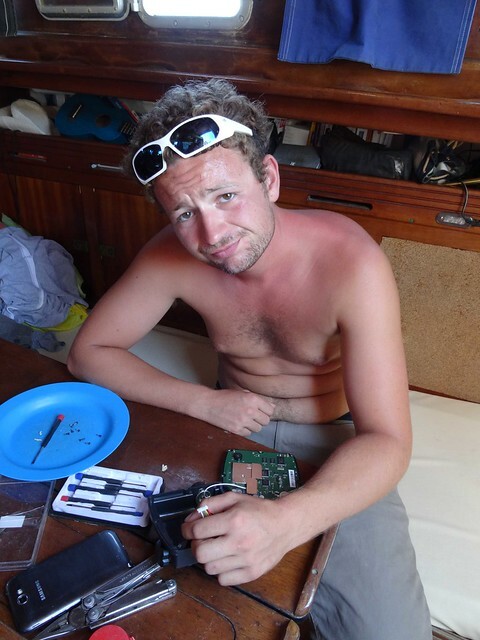 The marina is dirty and ugly : old TVs are floating with other garbages around the boat, and the night costs 45€. The showers are dirty, and don’t include a lock. The marina manager will start yelling at the ducks while saluting his sailors friends at 5 in the morning ! The really bad idea was to dock just in front of his office. We are clearly not satisfied with the services and so I try to negociate the night’s price. He threatens to ask for 60€ and call the cops if I’m not happy. Resigned, I still need to insist to get my passport back after he made a photocopy of it. Whatever, it’s 7 AM, and we head to Ostia, a marina we expect to be expensive, but with all the services included. The staff will be nice and helpull, smiling while giving us advices on how to reach Roma and where to start our visit ! 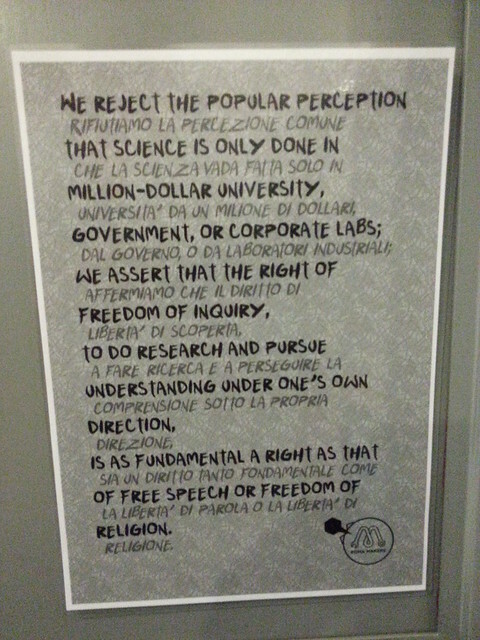 We hurry up to be able to meet with the Roma Makers fablab team ! 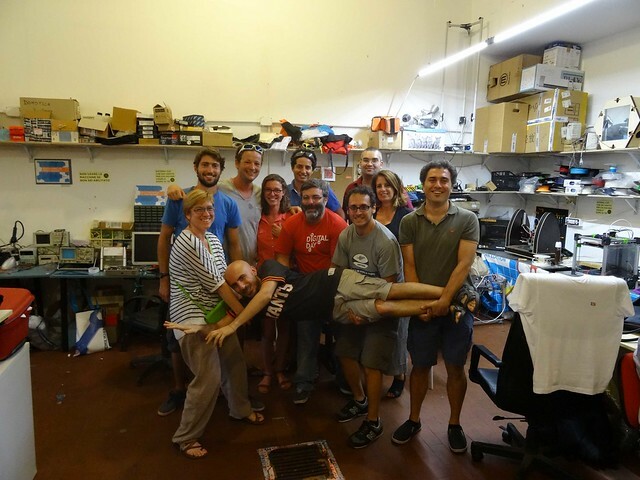 This fablab is actually a big community of makers, and the place we will visit is just its headquarters : they have other places in Roma and in nearby cities. The visit will begin by tasting a delicious homemade italian ice-cream. 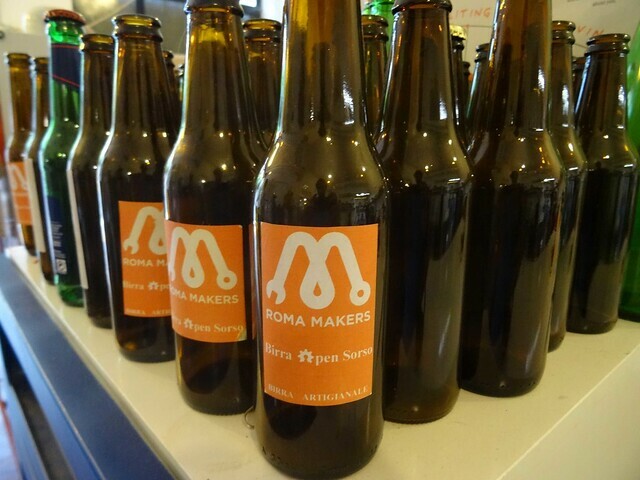 One sure thing : the Roma makers team knows how to enjoy their living ! Among all their projects (they have 150 members in the non-profit organization), they will first tell us about their own brewed beer, an open-source beverage ! Too bad they were finished when we visited, but thanksfully the recipe is online ! 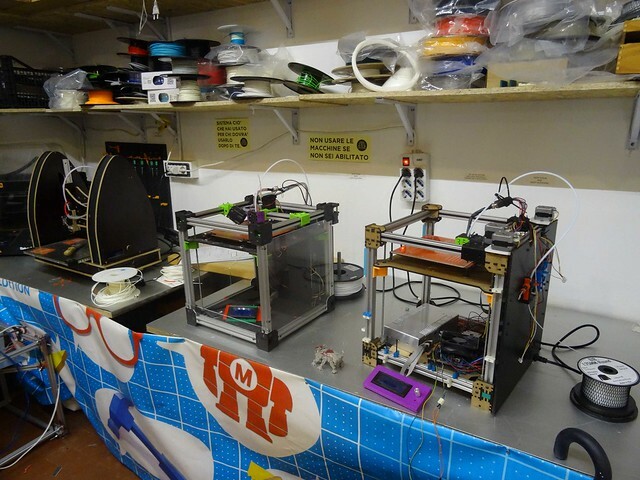 We also discover their 3D printer : the fa()3D (falla3D) : the big sister of our Mondrian. The designs are very similar, but theirs have a little advantage : the X-axis carriage is sustented by magnetic rails, hence considerably reducing friction. A lot of advantages thanks to this innovation, and on Karukera, we think about the noise reduction that would let us sleep a little more ! A few pieces are almost malfunctionnating on our 3D printer, and they will very kindly give us spare parts in case they broke. 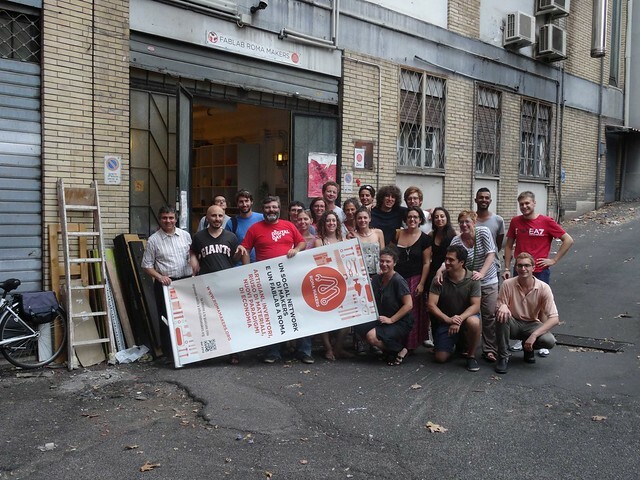 The fablab has two types of members : the very active ones who have access to the lab 24/7, and the other bigger part of the community who have access from 5pm to 11pm. Having arrived at 4 :30 pm, we can see the difference when the clocks turns to 5 ! The atmosphere is excellent between the different groups working on different projects but sharing laughs all together ! We will make a few group pictures, everyone trying to add his own funny input ! 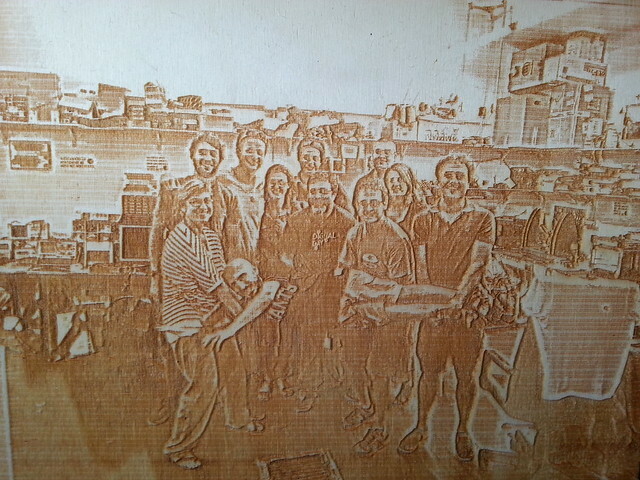 They decided to take the picture file and print it… with a laser cutter ! A wooden plaque is sculpted by the machine. The picture is now in Karukera, and will remind us this nice instant ! But other members are arriving while the picture is getting laser cutted ! We need to take an other picture ! The mechanics neighbour was just finishing work at this moment, and will have to be very patient for everyone to be ready to immortalize this quite chaotic instant ! How inspiring it is to see this nice makers enthusiastics and happy, doing whatever they want but very professionally ! We do share the same values, and that’s conforting ! Two days later, they will come and visit Karukera. Quite a lot of makers for our beloved but small Karukera ! 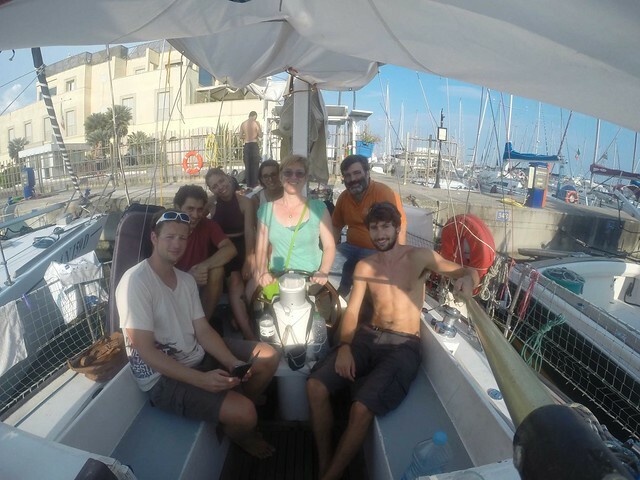 We exchange a lot of ideas about our projects, especially with some of them who are both skippers and makers ! We will finish the beers of the bar nearby before 9pm, with the help of Alix, the fifth crewmember of Karukera until early september, who directly meet us for drinks ! We clearly feel the « middle of the summer » atmosphere that has settled on board ! 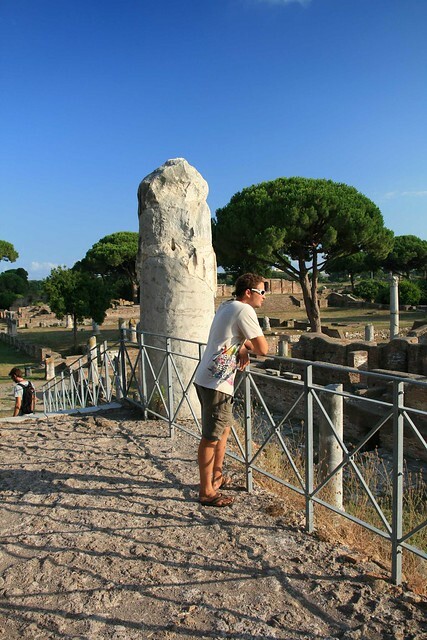 Obviusly we will enjoy the proximity of the ancient archeological site of Ostia to visit the impressive ruins of the old Roman harbour. 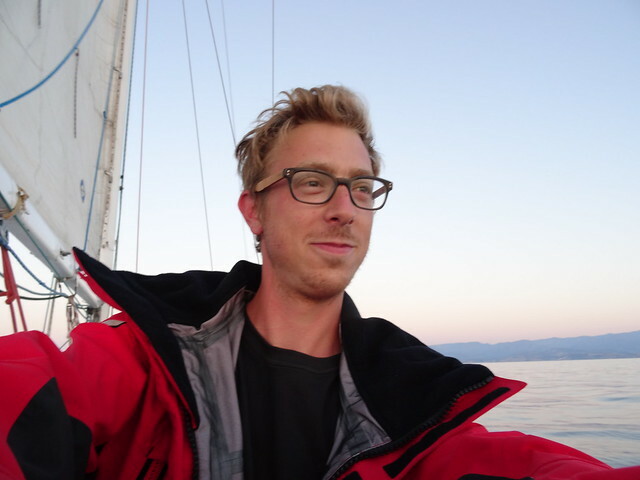 But wind is blowing : now is the time to head south ! Conditions are delicates for unseaworthy stomachs ! The swell is short and crossed, and it’s quite not confortable ! But the speed is there ! 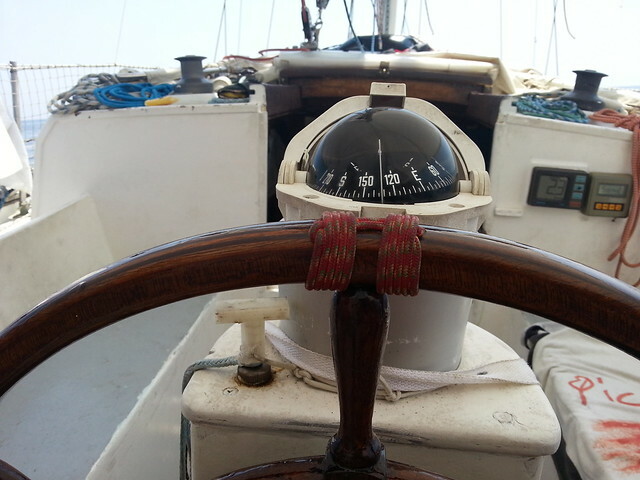 6 knots average is pleasing on our old boat ! Arriving to the Pontines Isalnds on Palmarola just before the sun sets is quite a show ! The archipelagos is composed of old volcanos, and altough we don’t really manage to see the « old volcano » part of the landscape, its beauty dazzled us ! 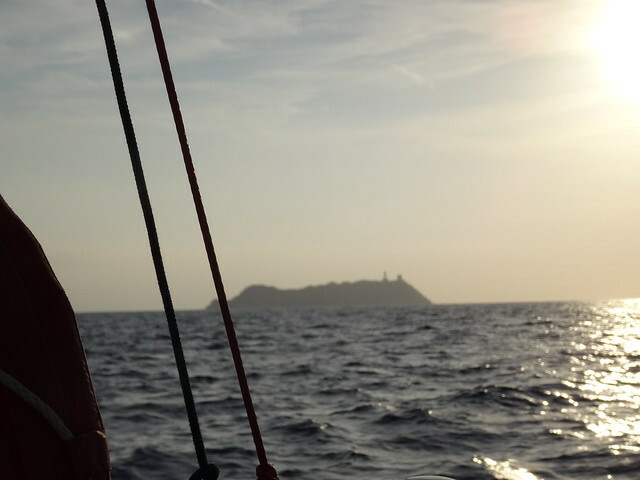 We enjoy a bit of peace and serenity : nautical guides advise not to anchor around the Island, so we are almost alones. By the way, this is not the first time that they totally mistake on a place : here the ocean bed is good for the anchor, that will hold despite the important gusts falling from the cliffs ! We already see the next Island, Ponza, reputed the be the most beautiful of the Pontines. 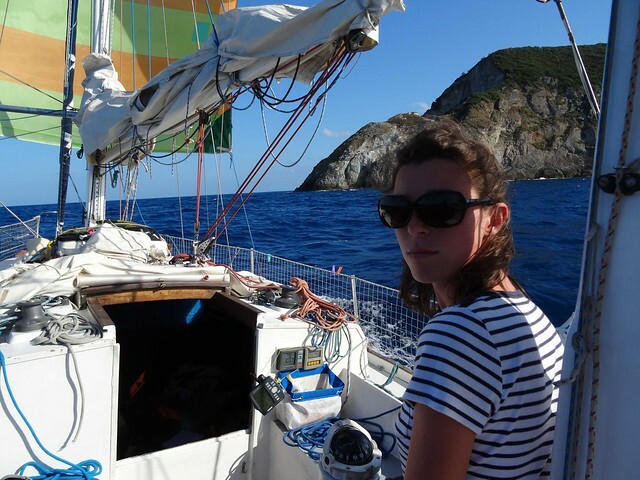 And Ponza, the nautical guides speak about it ! Hence the night in the harbour costs 100€ ! We will find a nice spot to drop the anchor instead. Sailing between the Islands is awesome ! 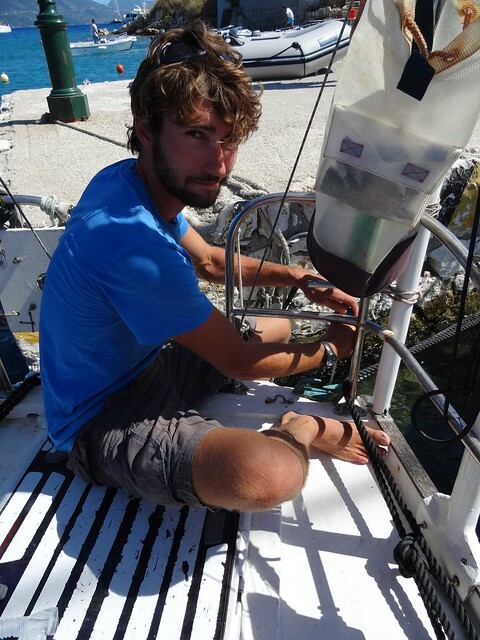 Palmarola protects us from the swell, which allows us to make a planktoon sampling, and will let Alix participate to the manoeuvers. The Island is beautiful, and the litlle harbour charming ! But we have to anchor very close to the shore to let room for the hydrofoils manoeuvers ( a « flying » very fast ferry). The coast guards check that we don’t anchor in the forbidden zone, but altough we are far enough, they will ask every boats to leave on the following morning ! We will finish the breakfast in the nearby cove, and after a litlle bit of snorkeling, we will head to Ventetone, the most southeastern of the Pontines Islands. Naples is getting closer !